My dad was a green grocer back in the day. He wasn’t a vegetarian but he liked a wide variety of vegetables and it was his influence that gave me my love of veggies. Green veggies rather than sweeter root vegetables are my thing, so I’m not finding 130g portion or so of green veggies mentioned in the meal guides frightening, but it would seem that I’m in the minority, with cries of ‘I can’t eat that much raw spinach’ from fellow 90 day-ers. Not sure I could eat that much raw! I’m not suggesting you come up with greens based desserts but the thought of spinach in the smoothie really doesn’t appeal to me. If you prepare your greens with love and care, you will grow to love them. This morning I’ve read a Q&A relating to spinach and how to not make them slimy. Spinach is 92% water, yet I’ve read that some are wilting their spinach in boiling water. Spinach is one of the simplest of the green veg options to cook and because of its high water content, you can wilt it in a hot dry non stick pan, no water and no oil. The leaves wilt but the stems still have a little bite to them. If it’s an ingredient in a recipe, add this at the end and the residual heat will cook it – several of my recipes in C2 do this for example. Here’s my favourite way to serve spinach and I’ve had spinach this way for years! Make a warm spinach salad by wilting it in a dry hot non stick pan. 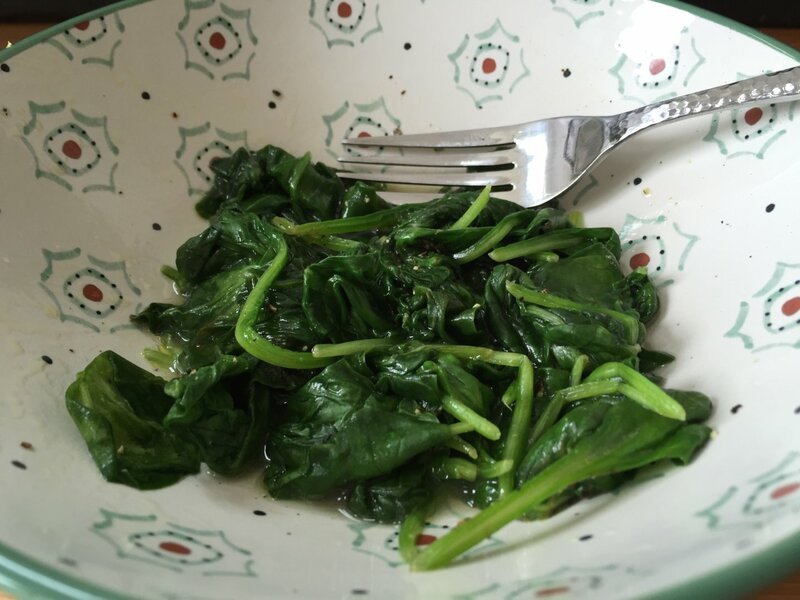 Put the wilted leaves in a bowl, add salt, pepper, juice from half a lemon and all or some of your olive oil allowance – I will feature this as a stand alone recipe, but the image shows what 125g of my wilted spinach method yields. It’s not that much, its delicious and full of the good stuff! Previous Post 26th July 2016 – The day i got the kick up the backside i needed!